One of the things that I love about Chicago is the diversity of its many neighborhoods. Each area has a different vibe-- hipster, family-oriented, upscale old money, etc. What I didn't realize about many of them though is that the character of the neighborhood is still reflective of the culture that originally settled there. This always takes me by surprise and I'm not really sure why-- I mean, everyone expect Chinatown to feel Chinese and Little Italy to be chock full of Italian restaurants. But, the Swedish influence in Andersonville and the German businesses scattered throughout Lincoln Square were great reminders of how the neighborhoods began. Recently, I had my biggest surprise when visiting the Ukrainian Village neighborhood. Again, I assumed that it was just a historical name for what I understood to be an up and coming hipster family neighborhood. Well, I was wrong. As soon as you cross Damen on Chicago Avenue, it's like you're entering another country, not just another neighborhood. The signage, the businesses, the language I heard spoken around me-- almost all Ukrainian. It was fascinating! And amazing to me that in a city whose neighborhoods change so quickly that this one still has so much of its old world roots and charm intact. The City Walk began on Chicago Ave. near Oakley Blvd. at the Ukrainian Institute of Modern Art . Apparently, they host exhibits and performances here and currently they are featuring a traveling Bauhaus exhibit. Pretty cool! Next up was 2304 Chicago Ave. . It used to be called the Village Cafe (which was what we were looking for), but like we have encountered with so many other City Walks, today it is a new business called the Ukraina Deli. After that we walked up Oakley, a quieter more residential street to find the St. Nicholas Ukrainian Catholic Cathedral . It's a beautiful ornate church reminiscent of many of the churches and cathedrals I visited in eastern Europe. It was cool to find this one tucked away in the middle of a quiet Chicago neighborhood. Back on Chicago Avenue we found the Ukrainian Cultural Center , a gathering place for parties, meetings, and weddings for Chicago's Ukrainian community. Behind the Cultural Center and only a few blocks away from St. Nicholas is another Catholic church: Sts. Volodymir and Olha Ukrainian Catholic Church . The congregation and the actual church are not that old-- it was built in the 1970's and the design is a contemporary nod to traditional Byzantine architecture complete with gilded domes. South of the church on Oakley Blvd. and across the street is the Ukrainian National Museum . It's an unassuming building in the middle of another quiet residential neighborhood and is home to a library, archive, and collection of traditional Ukrainian folk art. Next door to the Museum was quite possibly my favorite stop on the Walk: 2258 W. Huron Street . 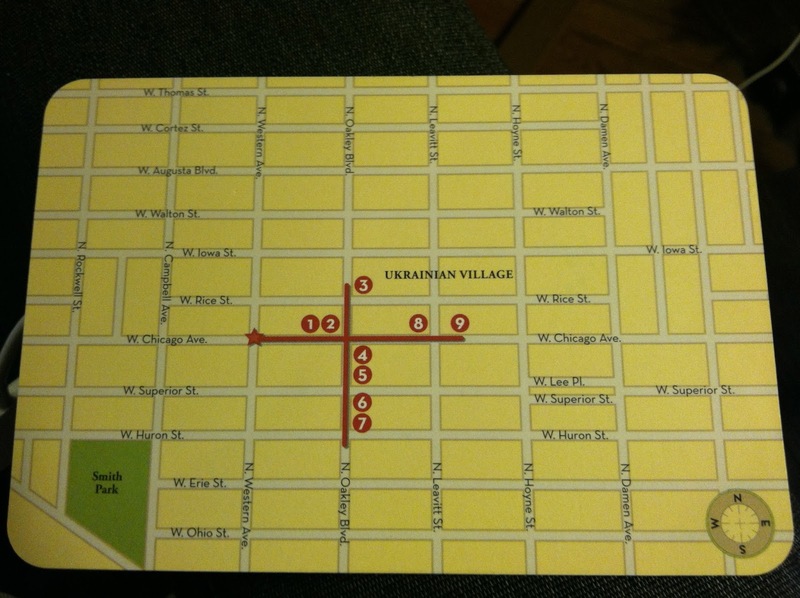 The City Walk card refers to it as a "symbol of the change taking place" in Ukrainian Village. It's an old school building that has since been converted into some very cool loft condos. I Googled them-- check this one out. It's on the market! We live in a converted loft building, so I am already partial to them... I love the details on this one. It still says "Skola" above the doors. We wandered back up to Chicago Avenue to find that our next stop no longer exists. The Ukrainian Village Grocery at #2204 Chicago Ave.  is no more. In its place we found some of the new construction I just referenced. A lot of the less well kept buildings along Chicago Ave. (and the surrounding streets) have been torn down in favor of new mixed-use buildings. We were pleased to find that the last stop on the City Walk was alive and well. Ann's Bakery  marks the "end"' of Ukrainian Village and the beginning of the East Village neighborhood at Chicago and N. Leavitt. Lured by the baked goods photos on the exterior, Alex and I popped in to find that this is actually a small grocery store in addition to a bakery and deli. 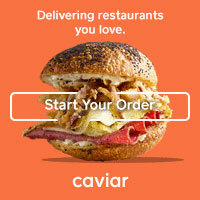 They're famous for their freshly baked rye bread and pastries. I was excited about the wide variety of pierogies available and Alex stocked up on a few bags of Haribo gummies. We spent a lot of time outside of the City Walk exploring this area and checking out some of the other residential architecture in the neighborhood. It's a really interesting mix of intricately detailed vintage rowhouses and modern new construction luxury homes. It's definitely a neighborhood I would consider buying in.